The following article, written by Corinne, was published in the “Axedale Antics” recenty. I think it says much about why Axedale is such a great community. When we took over the reins of the Axedale Tavern on September 26th 2010, I don’t think we were expecting the experience to be so rewarding. As a teacher, and superintendent at Fosterville Gold Mine, neither Garry or myself had any experience in the hospitality industry. When the opportunity of the ‘Aussie Dream’ presented itself, we gave it some serious thought. But with four young children, the idea seemed ludicrous. My mum’s husband Mick, had managed bars and clubs throughout Western Australia, so, throwing caution to the wind, the four of us thought, ‘Why not? Let’s give it a crack.’ We had the perfect plan. Mum and Mick would sell up in Kalgoorlie and move to Axedale, as our partners in this little quiet, country pub. Between the two couples we would work every second weekend and enjoy four weeks holidays per year. As in most cases, the best of intentions don’t always go to plan. Only three and a half months after taking over the business, the news of Mick being diagnosed with Cancer was news we were not expecting. Unfortunately, this dreaded disease had spread too far to give him a fighting chance, and in only five short weeks, Mick passed away. We had lost a partner, a step father, grandfather and business partner. The support from local residents at this time is when you really appreciate living in a small community. But…. as they say, the show must go on. It is not difficult to put on brave faces when the support around you is so evident. With the building being over 150 years old, and having had so many previous owners, we felt almost like ‘caretakers’ of this beautiful building, rather than the new owners. We were very mindful of keeping the character and history alive. We are fortunate that we have talented local builders who appreciate this as much as we do. We are proud of the changes that have been made. From a closed kitchen, and small courtyard, the hard work is paying off. There is nothing better than sitting in the beer garden on a beautiful day. We are constantly amazed at the distances people will travel to experience a day or night out in Axedale. From all parts of Bendigo, Echuca, Heathcote, Redesdale, Melbourne, Castlemaine, Seymour, the list goes on…. 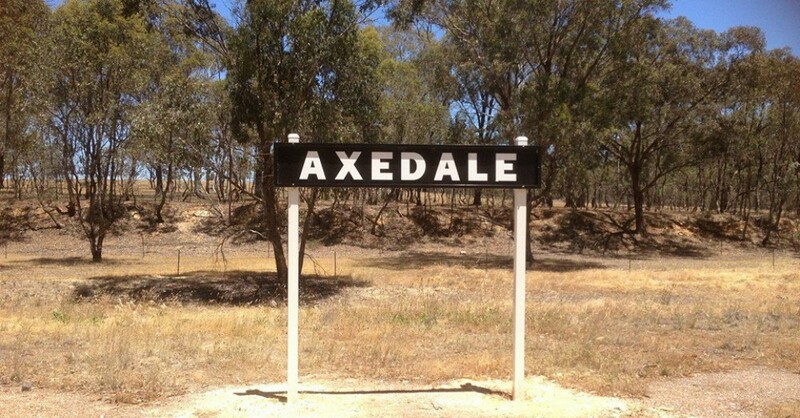 and of course Axedale. We have consciously tried to cater to varied tastebuds. From typical ‘pub grub’ to something a little more fancy, such as locally grown venison. From beer to local wines to milkshakes. The recent addition of the Coffee House has been embraced by both locals and visitors. It is a place to meet and chat, or stop for a well earned rest on a bike ride. While the journey of the past five years hasn’t always been easy, it has definitely been rewarding. We truly do have the local community to thank for the continued support we have received, not just at the Tavern, but with help with the kids and making us feel welcomed. It is a credit to the members of this community, and for that we thank you and look forward to the next five years. This entry was posted in Chat with a local and tagged Axedale, axedaleTavern, LaceStudy, one by Jennifer Jones. Bookmark the permalink.